MANILA, July 25 – Justice Secretary Vitaliano Aguirre II on Tuesday supported Solicitor General Jose Calida in seeking for the courts to cancel the bail bonds of the leaders and members of communist group National Democratic Front (NDF) and recommit them to their detention facilities. 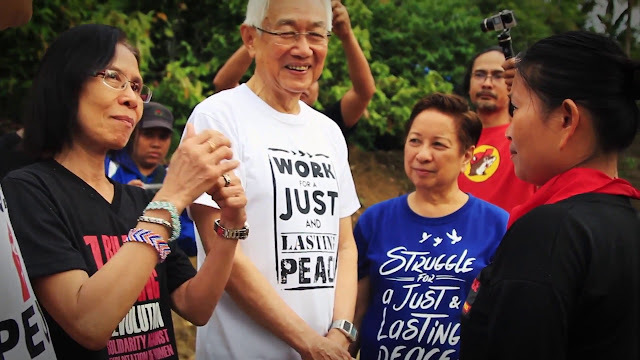 Calida made the initiative after Presidential Adviser on the Peace Process Jesus Dureza declared the back-channel talks with the communists a failure due to recent attacks by the New People’s Army (NPA), the armed wing of the Communist Party of the Philippines (CPP). "I agree with the OSG. Their release was temporary and preconditioned on the peace talks. If the peace talks will no longer be pursued then they should go back to jail," Aguirre said. Aguirre said the NDF leaders cannot invoke the 1995 Joint Agreement on Safety and Immunity Guarantee (JASIG), which provided for their immunity from arrest, because it was already superceded by the SC ruling in August last year granting their bail. Aguirre said the DOJ will leave to the OSG the filing of necessary motion in regional trial courts handling the cases of the NDF leaders. Apart from the Tiamzon couple, the other NDF leaders granted bail were Tirso Alcantara, Ma. Concepcion Bocala, Pedro Codaste, Renante Gamara, Alan Jazmines, Ernesto Lorenzo, Ma. Loida Magpatoc, Alfredo Mapano, Ruben Saluta, Adelberto Silva, Ariel Arbitrario, Renato Baleros Sr., Kennedy Bangibang, Jaime Soledad, Rafael Baylosis, Alex Birondo, Winona Birondo and Porferio Tuna. The DOJ chief, however, assured that the conditional pardon granted by President Duterte on 10 convicted communist leaders and members would remain. "That pardon cannot be recalled because of the cancellation of peace talks," he noted. Aguirre explained that the pardon granted on NDF peace consultant Emiterio Antalan and nine other political prisoners -Joel Ramada, Apolonio Barado, Jose Navarro, Generoso Rolida, Arnulfo Boates, Manolito Patricio, Barigueco Calara, Sonny Marbella and Ricardo Solangon - was hinged on other conditions. The pardon grant released by the Office of the President last July 7 came with conditions, including reporting to their chief parole and probation officer at least once a month, allowing visits from the Philippine National Police Provincial Director of their area of residence, and no change in their residence during the period of parole without obtaining consent from authorities. According to OSG Spokesperson Atty. Erik Dy, the Solicitor General already instructed the handling solicitors to ask the courts to cancel the bail bonds of the NDF consultants, order their arrests, and recommit them to their detention facilities. “The conditional release granted them by the courts are for the sole purpose of the formal peace negotiations. The conditions are based on the Supreme Court Resolution dated 2 August 2016, and not based on JASIG.” Dy said, pertaining to an SC Resolution involving NDF leaders Ocampo, Echanis and Ladlad. “The conditions provide that should the formal peace negotiations cease or fail, their bond shall be deemed automatically cancelled,” Dy added. Last May, President Duterte suspended formal peace talks after both sides failed to resolve a dispute over the Communist Party of the Philippines' order for the NPA to step up attacks against the government. Last February when President Duterte also cancelled the peace negotiations due to the killing of three unarmed soldiers in Bukidnon, Calida also said he would ask the Supreme Court and the regional trial courts, where the said NDF consultants are facing various charges, to issue recommitment orders to bring them back to detention. He pointed out then that the resolution issued by the SC in August last year imposed conditions for the provisional liberty of the NDF consultants, which he explained were adopted by the concerned RTCs in allowing the release of the said personalities on bail for them to be able to participate in the peace talks. But Dureza downplayed the recent cancellation of the back-channel talks, saying it is just a temporary hitch that could still be resolved by both parties.